This is not my deck, it's been around since long before me and used by other well known players such as CthulhuGirl, but I'll post it for the sake of including other decks that I run, and that I can recommend running. The three commanders are all Zombie Scavengers, who gain buffs to their power and health as your Undead characters die. Most of the deck's characters cost between 1 to 3 resources. The strategy here is to early game play hyper aggressive with weaker Undead Characters, forcing your opponent to outpace or block you. If they block, your undead army gets stronger, if they try to outpace and are succeeding, you'll need to switch to defense. Match their offense with your defense, or vice versa, and continue this to make your Scavengers stronger. As the game goes on, they will likely destroy your army in some way or another. Then, at resource 7, you can play Hehkeem the Corrupted, who will summon all Undead characters in your graveyard with 3 cost or lower back to play. You'll continue to cycle your graveyard in this fashion if necessary, but ideally you will win after the first Hehkeem play. 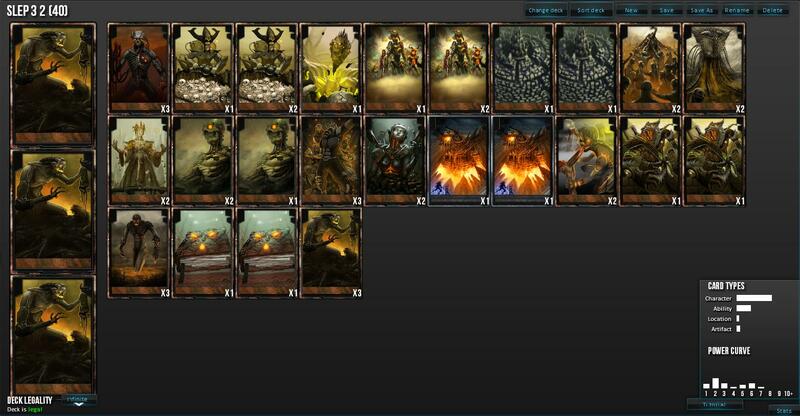 This deck often loses to decks that can outpace it early game, but if it gets going by mid game, it's quite solid.